As a host for contemporary artistic projects, the Schindler House is delicate yet formidable, challenging yet rewarding. Each and every intervention is the result of an intricate process of discussion, debate, deliberation, and creative problem solving. Schindler Lab concretizes this process and makes it transparent. Longtime MAK Center consultant and collaborator Sara Daleiden proposed the initial idea for a serial program to director Kimberli Meyer. Daleiden’s concept was rooted in previous MAK Center exhibitions that she perceived had successfully re-framed the experience of the house. 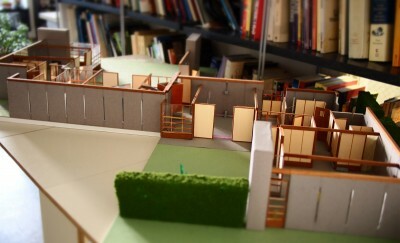 Artist Olivia Booth and architect Thurman Grant, both dedicated advocates of the Schindler House, were core inspirations for Schindler Lab, and were thus invited to envision its first iteration. After a series of meetings and studio visits, the project was approved and funding sought. Mounted in 2011, the Booth and Grant installation constituted Schindler Lab, Round One, and is documented in the Realized Projects section of this publication. Its success prompted further development of the series. For the second round, we decided to seek proposals though an invitational call for submissions. A team of individuals with close connections to the Schindler House and the MAK Center was called upon to serve as advisors. We asked them to suggest emerging and established artists, architects, and designers who would be well suited to analyzing and engaging the house. All of the recommended practitioners were invited to submit a proposal. In early spring 2012, we received and reviewed 33 propositions. Of the proposals, a few were selected for realization or further development, and individual submissions by Julian Hoeber and Renée Petropolous were chosen for a two-person exhibition. After an initial green light, the project was halted, to the curatorial team’s dismay. A discussion about this thwarted project comprises the Conversation section of this publication. We then moved forward with proposals by artist Molly Corey and architects Frank Escher, Ravi GuneWardena, and Andrea Lenardin Madden. The resulting exhibition, called A Little Joy of a Bungalow, was mounted in October 2013 and is documented in the Realized Projects section. All who submitted were invited to have their work published in this online book; the majority agreed and their proposals can be found in the Proposals section. Additionally, we asked people who had realized projects at the Schindler House over the years to weigh in with their impressions of working at the house. Those texts can be found in the Musings section of the publication. Undoubtedly the Schindler House has been one of the most influential designs of the 20th century, and its daring innovations became commonplace by the time of the architect’s death. The California house—a one-story dwelling with an open floor plan and a flat roof, which opened to the garden through sliding doors while turning its back to the street—became the established norm of postwar housing. The Schindler House is now recognized nationally and internationally as a totally new beginning, a genuinely fresh start in architecture. The Schindler House breeds cultural curiosity. In addition to wandering the grounds, visitors frequently avail themselves of the house brochure and docent tours. They often seek additional information and support to better understand the underlying social ideals that provoked the house’s unique architectural expression. Schindler Lab was generated as a didactic opportunity to further highlight both the architecture and the social history of the house, and to offer alternative views of the Schindlers’ logics and methods through installations, events, and media that are reflective of contemporary practice yet anchored in history. The project is part of the MAK Center’s constant rethinking of the house through a variety of understandings of its visible—and invisible—organizing forces. Our hypothesis was that multiple physical realizations in the space made by participants who have developed a genuinely creative and intellectual relationship with the house could open the architecture to new perspectives not yet considered by residents or visitors over the site’s 93-year history. A repertoire of new didactic materials could grow as a residue of site-specific projects, and the historical landmark would be enriched by such environmental experiments. The Schindler House is not a vessel. It is not an open venue. Its walls are never blank and its rooms are never empty. As soon as one sets foot on the property at 835 North Kings Road, one enters an entirely designed and controlled space and experiences an architectural program that has evolved since its initiation in 1921. Being in the house in 2015 represents so much more than the original intentions of Rudolph and Pauline Schindler. Today, preservation mentalities developed in the 1960s combine with the energy of twenty-first-century global archi-tourism to present contemporary exhibitions and events in a building meticulously restored to a wishful version of its day of completion. All this takes place in a city that prioritizes new development above all else. The layers of influence stacked onto this stout house quickly reach towering heights. We have approached Schindler Lab from this understanding, and have made an effort to include local peers in the consideration of how best to host timely critical inquires in a place already active in many roles, a place that, at any given moment, is a node in multiple sequences of architecture, history, and cultural production. Recurring themes in the proposals can be divided into two types: the architectonic and the social. The former category includes motifs such as symmetry and the pinwheel floor plan, the 4-by-4-foot module and mutations of the grid, windows and the role of natural light, and landscape as architecture. The social topics include the physical and social aspects of the Schindlers’ domestic experiment and their interpersonal dynamics; utopian ideals at the advent of L.A. Modernist architecture, including the concept of genderless space; and the Schindler House’s historical role as a hub for progressive artistic and political activity and its current function as a cultural center with a novel approach to preservation. The proposed and realized responses to the Schindler House make apparent another important role for the house: as a site ready to accommodate site-specific art and architecture installations, rather than self-contained objects. Over the past fifty years, site-specificity (and its offspring: “site-responsive,” “site-determined,” and “situation-specific” art and architecture) has developed certain widely employed clichés and superficialities. Most prevalent is the franchising tendency, in which a predetermined style of installation work is customized for interchangeable locations. In curating the Schindler Lab series, we’ve prioritized projects that identify the initial complications posed by the site as opportunities and treat its context as the beginning of a thought process rather than as a factor for negotiation. We’ve been stimulated by proposals in which biographies of the house’s historical residents frame future events, in which the institutional presence is highlighted by working with the current habits of paying visitors, and in which inconsistencies in the house’s self-presentation prompt questions about the nature and narratives of preservation. We’ve been most compelled by projects that, in addition to deeply engaging the site, have also found ways to reach beyond it and, in a sense, explode the site, opening it up to a dialog with broader questions of ownership, authorship, consumerism, and autonomy. As exhibition scenarios mutate more and more each year, it’s important to consider if sites and their inherent conditions are being problematized sufficiently, and to pause and examine whether popular methods are effective in catalyzing discourse and discursive interaction or if they function merely as novelty. This publication offers an opportunity to survey new ideas emerging from the concrete and wood of the Schindler House while simultaneously acknowledging the site—and the program itself—as problems in organized complexity. 1 Jane Jacobs, The Death and Life of Great American Cities (New York: Random House, 1961), 434. Anthony Carfello is Deputy Director of the MAK Center. Sara Daleiden is a cultural producer based in Milwaukee and Los Angeles and series initiator of Schindler Lab. Kimberli Meyer is Director of the MAK Center.